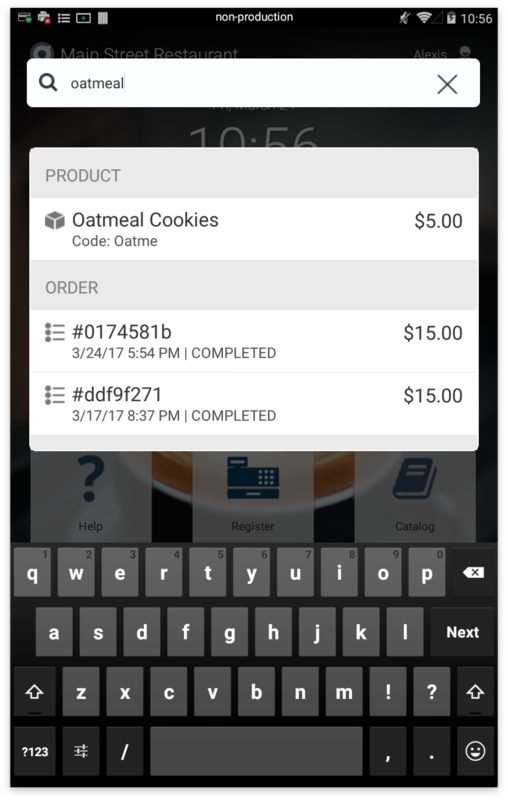 Merchants can now search from the Home screen or Transactions app to quickly access data involving transactions, products, and orders. Note: If a category includes more than 2 search results, simply click the "More" button in the top right corner to view all additional results. 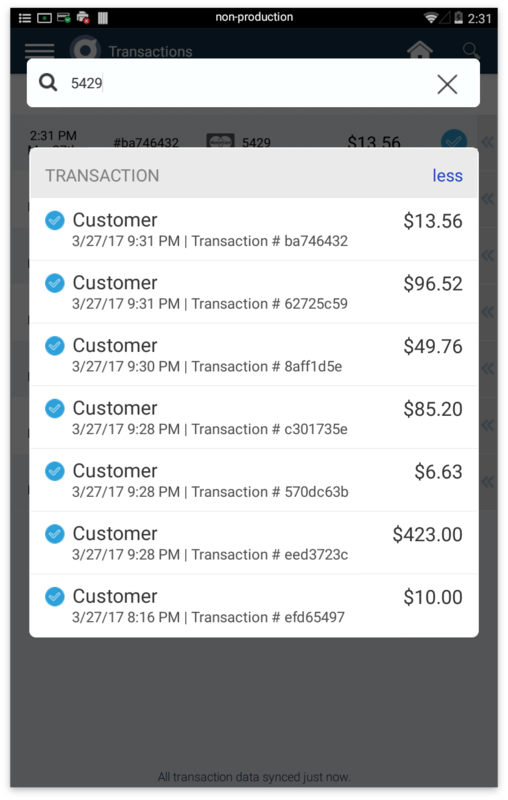 When you select the result you want, it will open up as it does in the Transactions app. When you select the Product result you're looking for, it will open and add the new product to an Order. 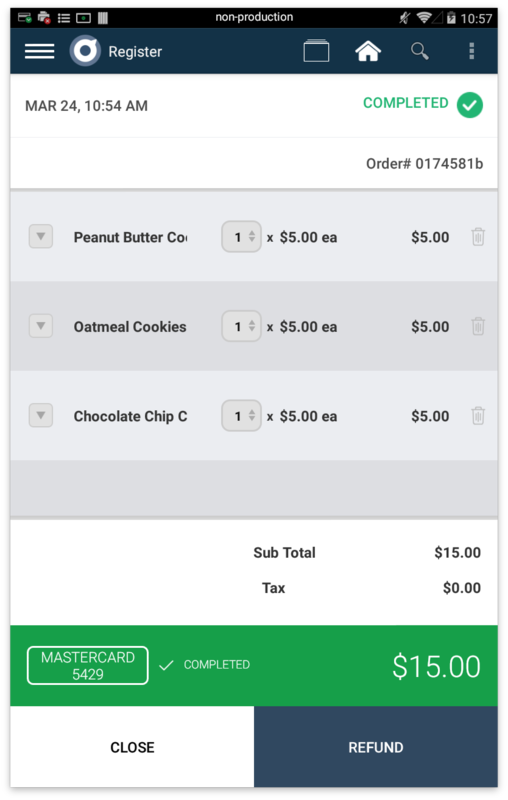 When you select the Order results you're looking for, it will open the order so that you may see the Order details. 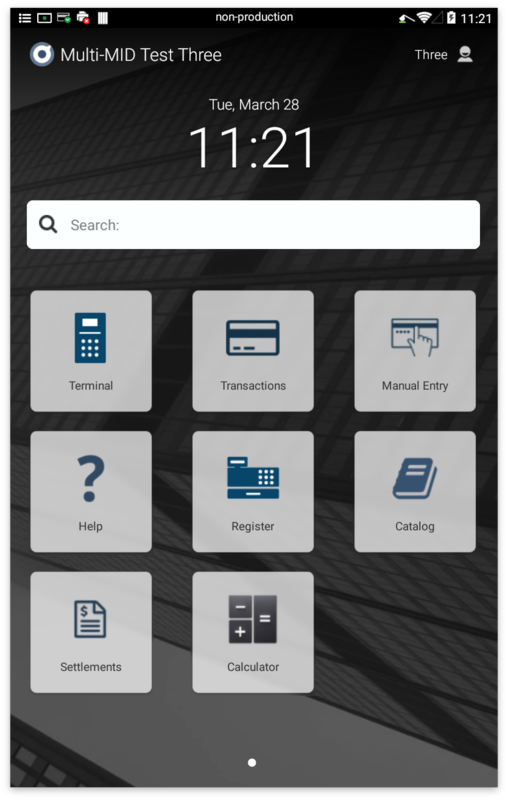 The Multi-MID feature allows a single physical terminal to be associated with multiple (up to 10) MID/TID from different businesses. This is used for businesses like salons where each stylist owns their own business and has a unique Poynt.net web portal account. 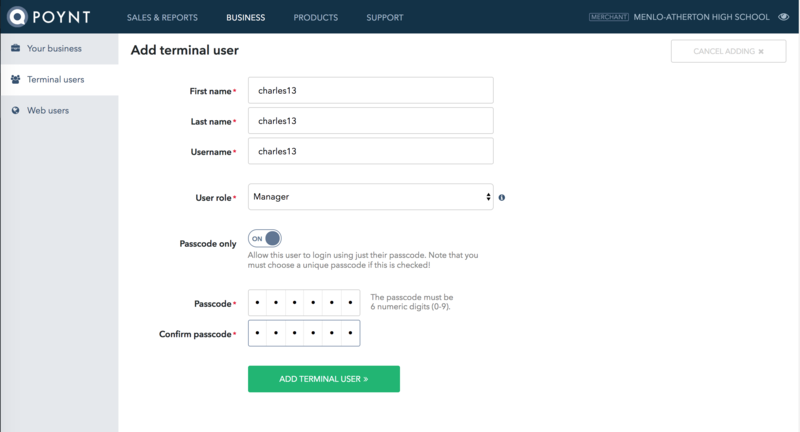 Once onboarding, activation, and approval is completed by the Reseller and Poynt support team you will be able to switch between MIDs just as you switch users on the terminal. 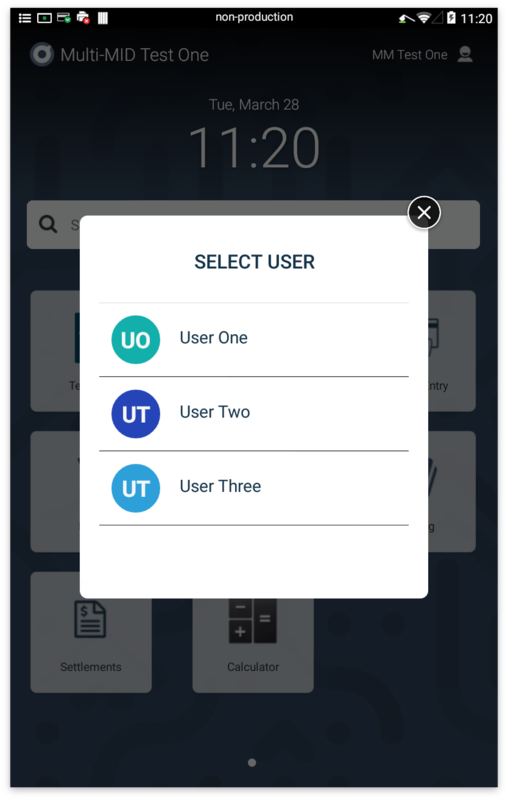 Step 1: Select current user in the top right corner. Step 2: Select the Terminal User and connect MID you'd like to switch to and enter PIN. Step 3: Note the new business name in the top left corner. 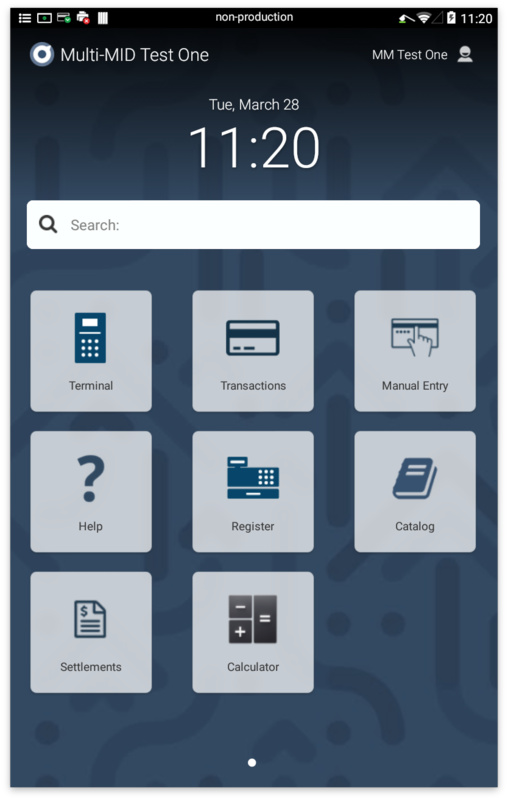 You have switched MIDs and can transact as a separate merchant on the same terminal. 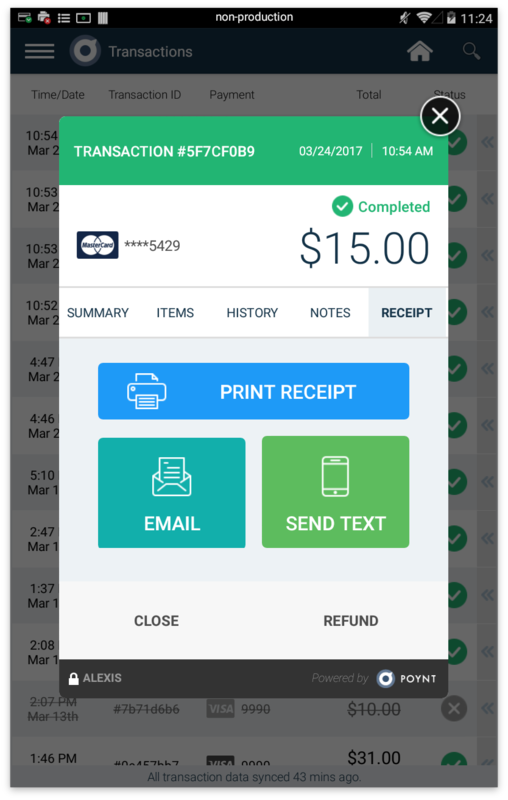 Merchants have the ability to resend email and text receipts from their transactions list after completing an initial payment. 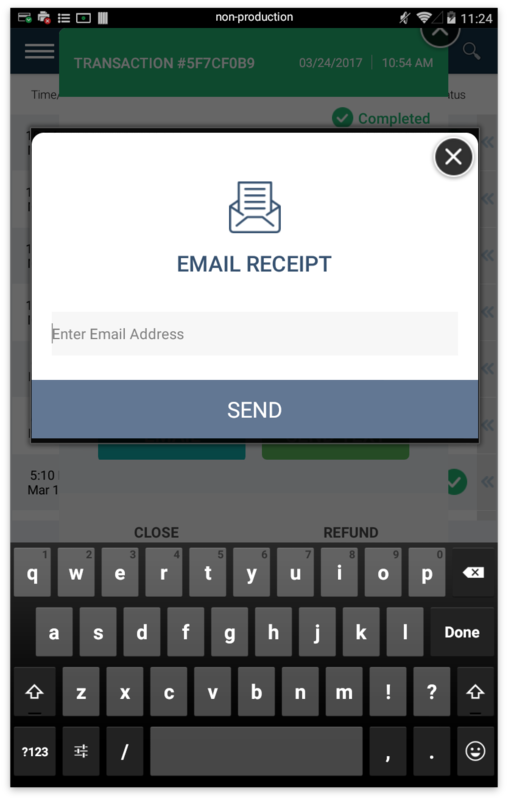 Step 1: Select Transaction of the receipt you’d like to resend. 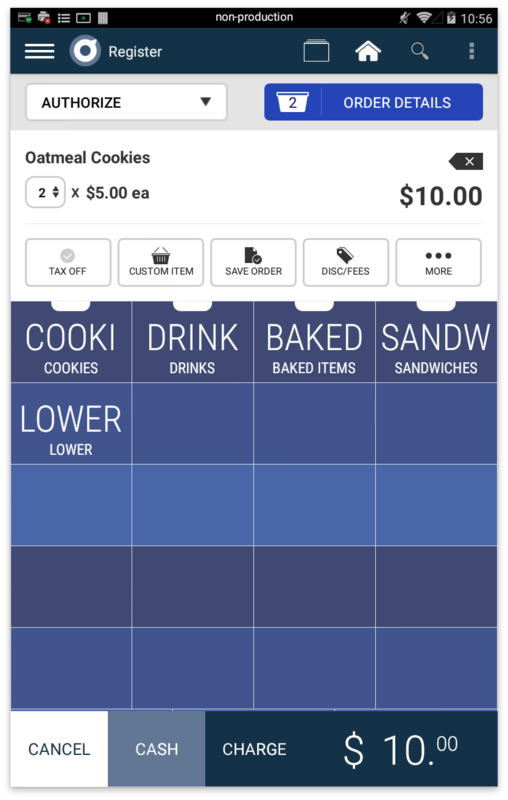 Step 2: Select Receipt Tab. 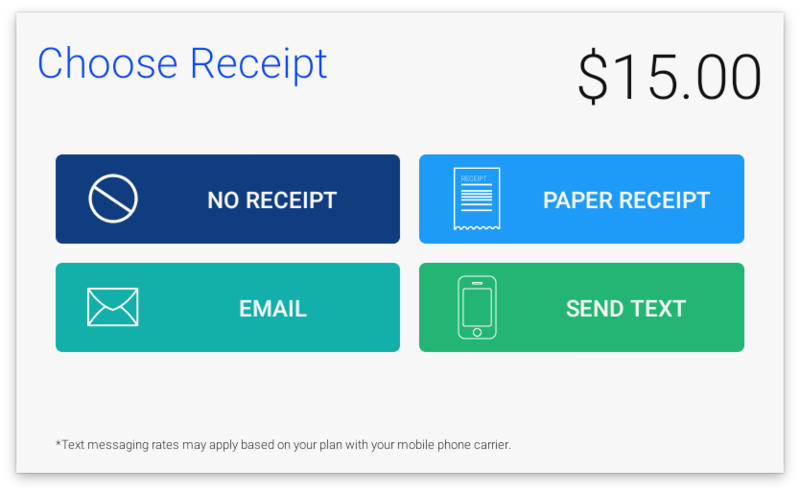 Step 3: Choose the type of receipt you’d like to resend. 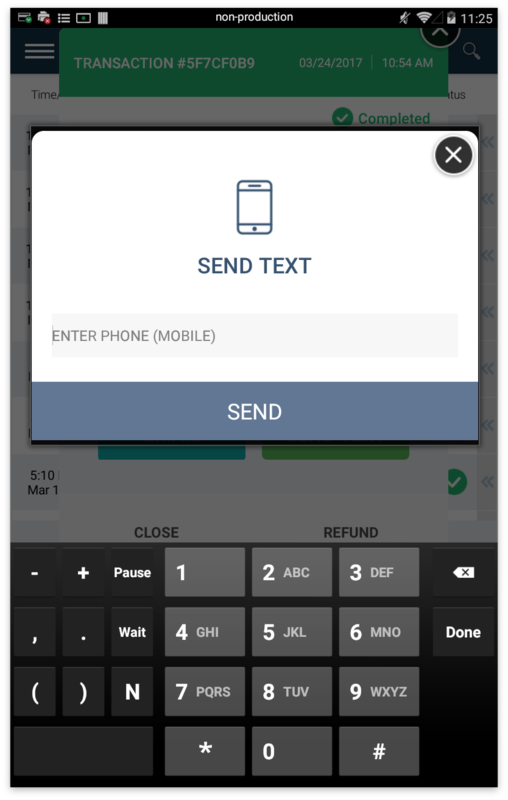 Enter the customer's email address or phone number on the merchant facing screen or customer can complete on customer-screen. 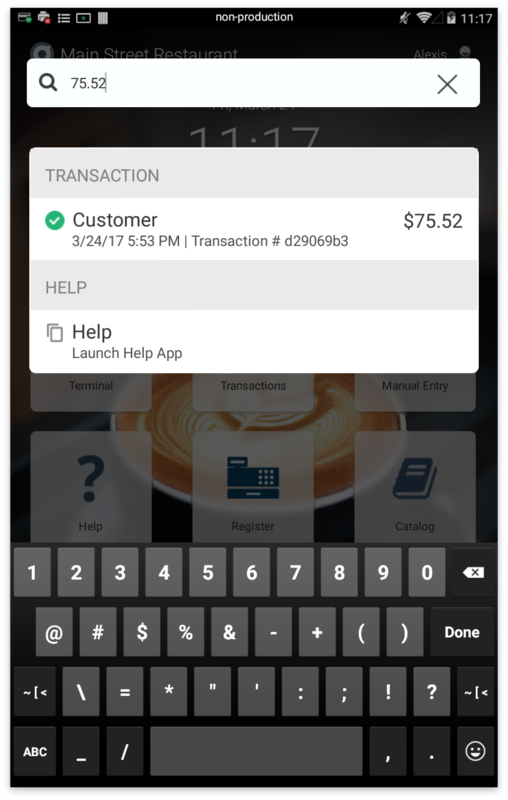 Note: After initially entering an email or phone number, the customer’s info will be stored for quick reference tied to their next card swipe. 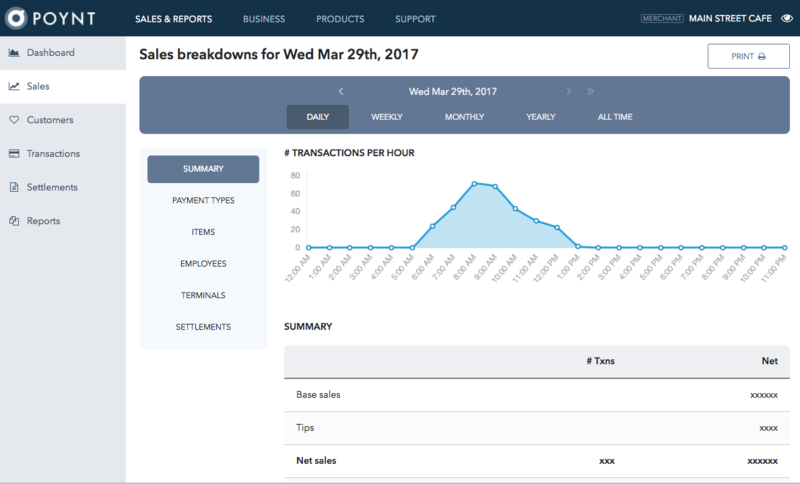 Merchants now have an upgraded view of sales activity under the Sales & Reporting tab on the web portal. 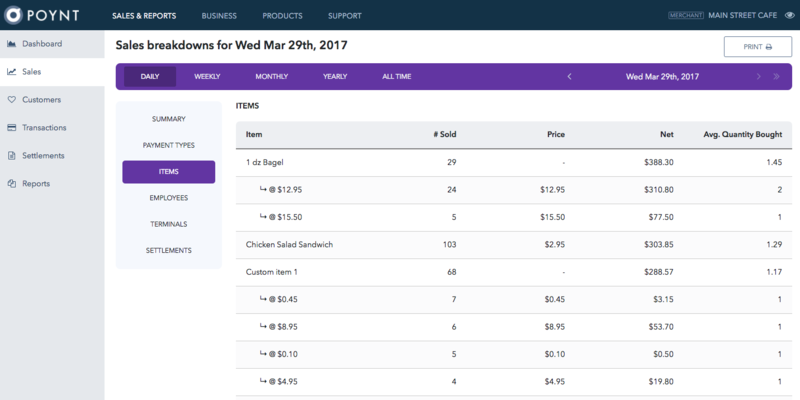 Summary - An overview of your business metrics at a quick glance. Payment Types - A breakdown of all of the payments accepted. Items - A breakdown of all the items sold. 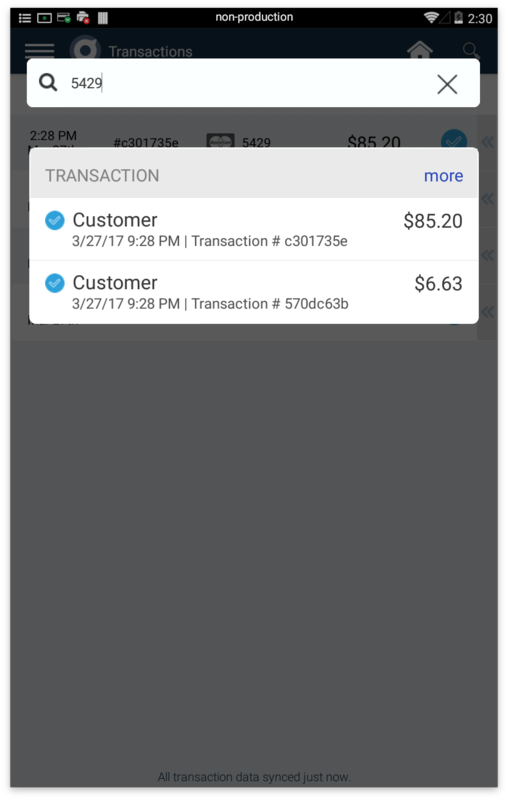 Employees - A breakdown of transaction info associated with each employee. Settlements - A breakdown of metrics gathered upon settling. 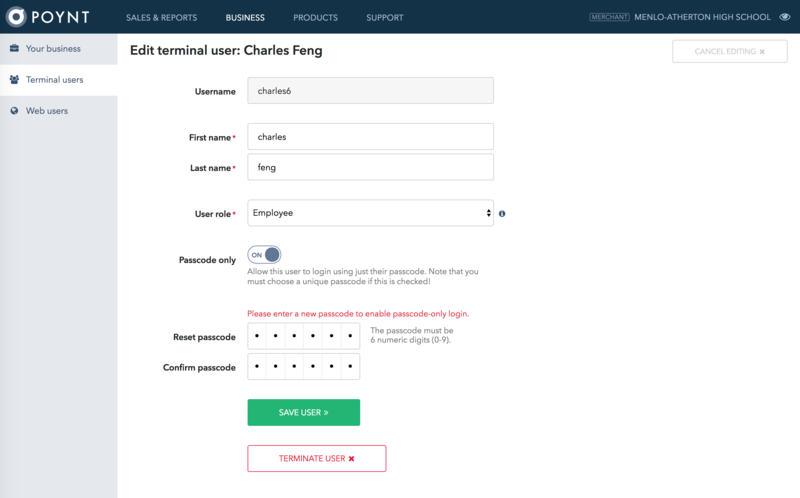 Merchants can now permit new and existing terminal users to sign into the terminal using just a passcode, enabling a faster login experience. Step 1: Create new Terminal User on Poynt.net web portal. Step 2: Toggle Passcode only option ON. Note: The passcode must be unique across the entire business. We will ensure that it is before allowing the user to be saved. Step 2: Toggle on Passcode Only. Step 3: Create new passcode for user.